Mummy went to Mysore to attend Mysha's first birthday. And i got to play Choti Mummy to June. 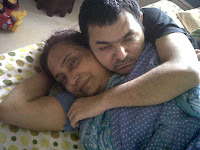 Initially, both Mummy and I were apprehensive about June Bhai staying away from her for 5 days, but we managed well! This was the first time, I was babysitting him all by myself. Also, i couldn't have done it without Sumit, my husband's support. First day went smooth, because June thought it was just one of his night outs at my house, and then the second day onwards, he was bored, sad, introspective and naughty to say the least. Clinging on to Sumit, as Chiggu Bhai talks to him. However, the next few days were not exactly smooth! June began to miss mummy. I could see it in his eyes. He felt lost and confused. I felt a little helpless because, I could only take care of his needs but not be Mummy for him! I learnt so much about parenting in these days. I have never contested that it is difficult for Mummy to take care of Bhai, but in the 5 days of playing Mother to June, i have renewed respect for mummy. I had increased love for my precious brother! The toughest task was to keep him out of the kitchen. June's cerebellum is damaged and with that, the satiatory centre of his brain. His hunger is never satiated and over eating results in increased blood sugar and other complications. So his diet needs to be monitored. He is a naughty boy, and i dare say, he loves to steal himself into the kitchen when no one's looking! My apartment is probably June's dream house, it doesn't have a kitchen door. So its easy access, which means every time he gets up, he goes directly to the kitchen. The first few days Sumit and I would follow him to the kitchen, much to his annoyance (he hates being monitored!). Later on I tried to intimidate him by scolding him, but in vain! The last resort for me was to place dining table chairs in the thoroughfare, so he could not enter the kitchen, and to my surprise, he looked rather amused with the arrangement! But it worked. June with his monkey hammer. Sleepy and pensive. We bought new toys for him to keep him busy. I watched Band Baaja Baraat with him, he seemed to enjoy the songs! By the 5th day, both of us were longing for our mother! For all my playing big girl and choti mummy to June, i realised that he doesn't look at me as a mummy replacement! And that Juney and I together are just two small adults trying to play BIG ones. By the fifth day, we were ourselves. I stopped playing big girl and Junna stopped being calm. He would hug me confused and i would hug him tired. I realised how small a baby Bhai really is. He bullies me alright, because he knows i am much younger to him. But when it comes to trust he lays immense of that in me. So I played slide shows of family pictures for him on my laptop, and he immediately reacted to mummy's photos. I kept telling him mummy will be returning tonight and i think he understood that. Later at night when Chiggu bhai came to take him home he went readily! He knew his mom was home now! Play Time is Play Time!